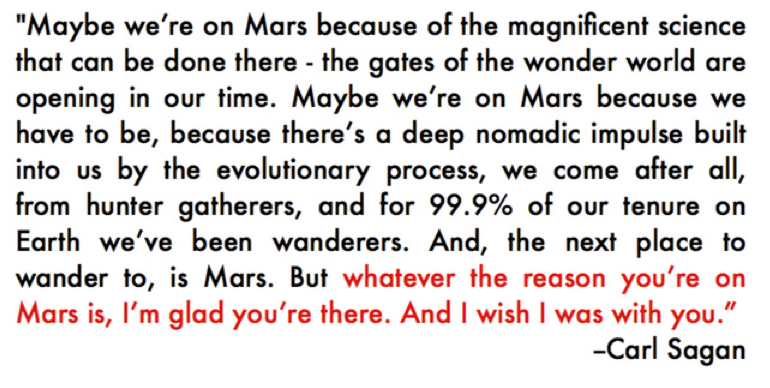 A few months before he died, Carl Sagan recorded a message which he dedicated to future explorers to Mars. Since early Monday morning, in the wake of the Curiosity Lander arriving on the surface of Mars it has begun to do the rounds throughout the internet. Sagan’s passion for the future of space travel is clear in this piece, which is heavily truncated in most of the common versions available online. Happily, I09.com hunted down the extended version of it and what is revealed is a thoughtful and emotional message from an inspirational man, passing a message he hopes will be heard by those that will fulfil his dreams. Physicist Neil DeGrasse Tyson returns with another stirring piece of rhetoric about the importance of scientific research. 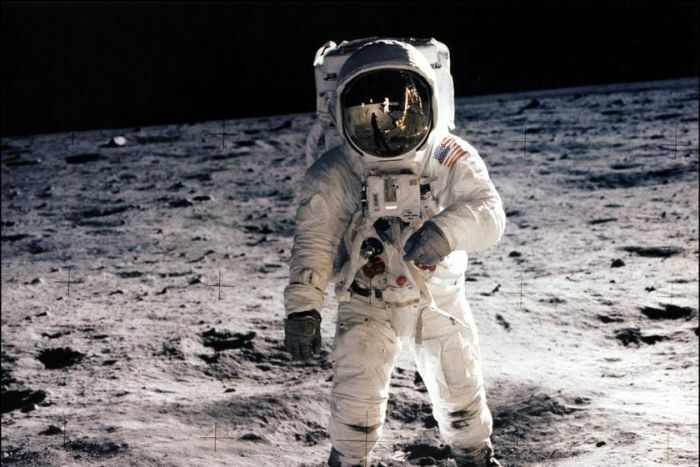 In this video, Neil looks at the global initiatives that occurred in the wake of the 1969 Moon landings and argues that it is the unique vision of a planet without borders that drives us forwards. 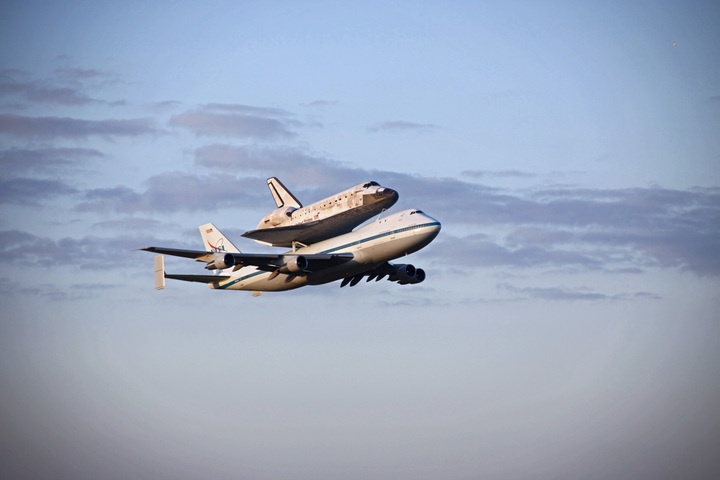 On Tuesday of this week The Space Shuttle Discovery took its final flight, piggybacking on top of a specially modified Boeing 747, en route to its final resting place at The National Air & Space Museum near Washington DC. 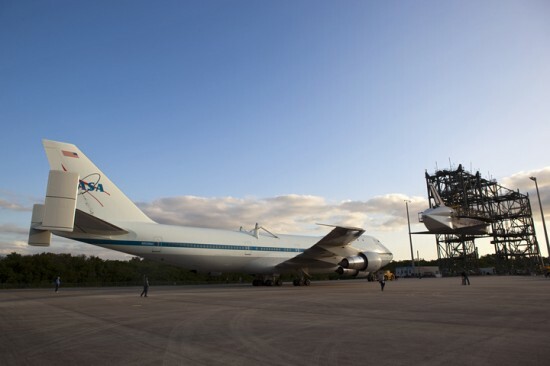 Since 1969, NASA has maintained two specially modified 747s (known as NASA 911 and 905 respectively) for the specific purpose of transporting the shuttles within Earth’s atmosphere. The planes were originally built as commercial airliners, but have since had almost all of their internal fittings stripped out and been modified for their very specific new job. 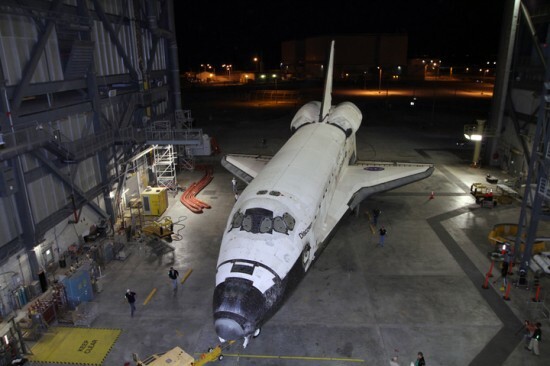 Over the years the two workhorses have ferried spacecraft all over the globe but the end of the shuttle program means the end for these two workhorses as well. 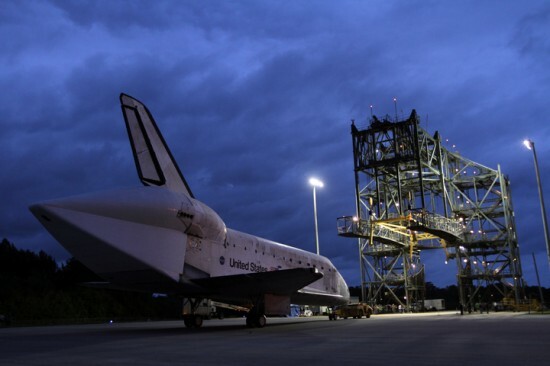 NASA 911 flew it’s final mission earlier this year, but NASA 905 still has a few very important final errands to run as it ferries the retired shuttles to their new homes around the US. 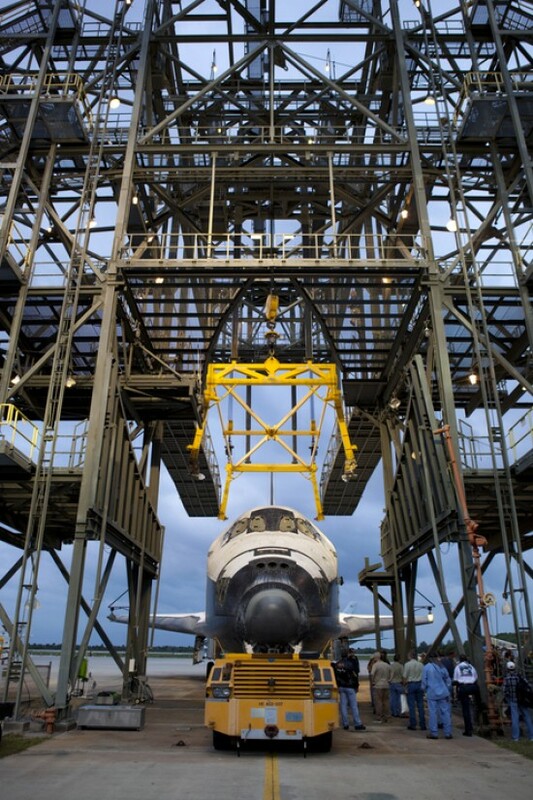 NASA was kind enough to publish several pictures of Discovery and NASA 905 getting ready for their final flight together, so I thought I’d share a few of them here. 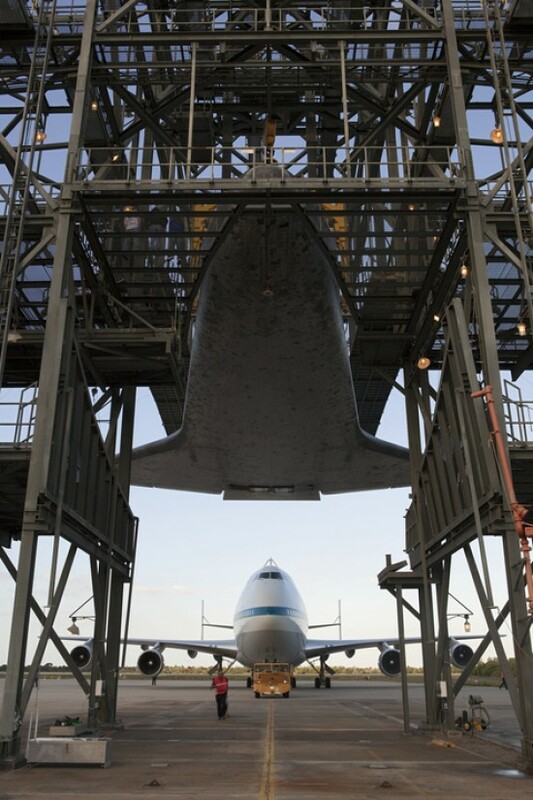 Discovery is prepped for its final flight. 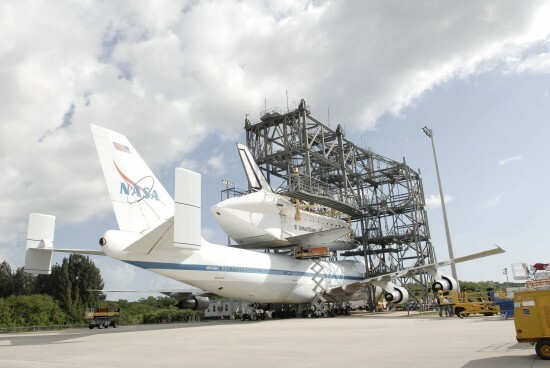 Discovery approaches the rig that will lift it onto the back of the Boeing 747. 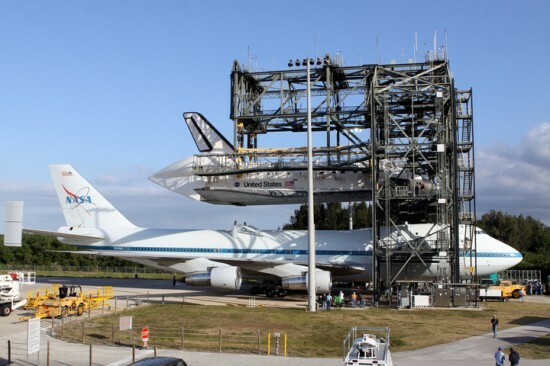 NASA 905 and Discovery together. 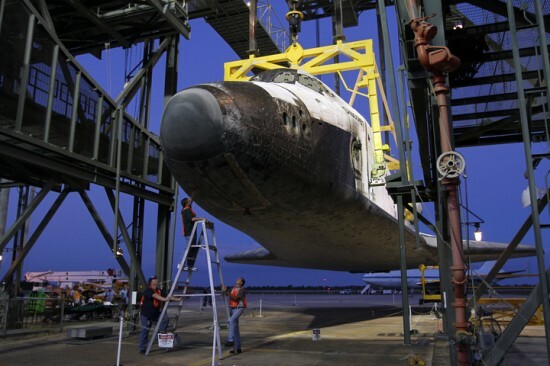 Crews work long into the night to lift Discovery safely into the air. The interior of NASA 905. 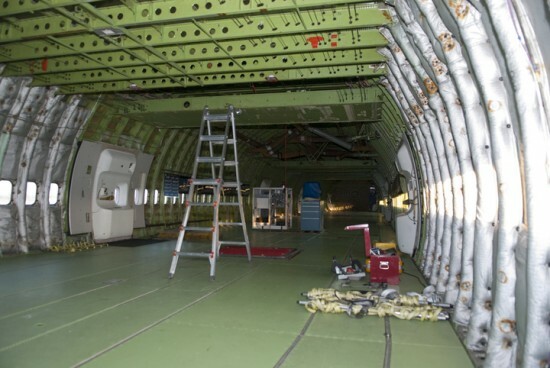 All non-essential fittings have been stripped out to reduce the weight of the craft but even with this, 905 still requires twice as much fuel as a normal 747 just to stay airborne. Manoeuvring NASA 905 into position. Preparing to "mate" the two craft. 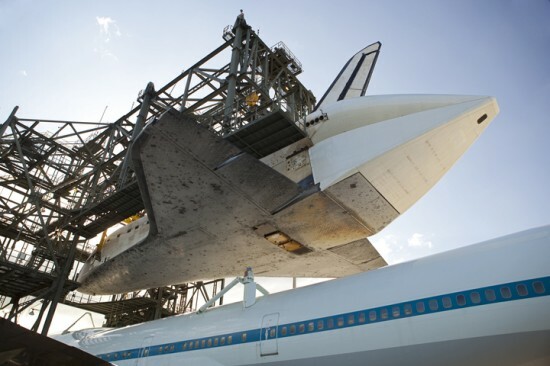 Notice the pointed cap that has been fitted over the shuttle's rear end. This is to reduce drag while in flight and prevent damage to the engines. After hours of painstaking work, the 747 and shuttle are finally joined. Godspeed, Discovery. Enjoy your retirement! 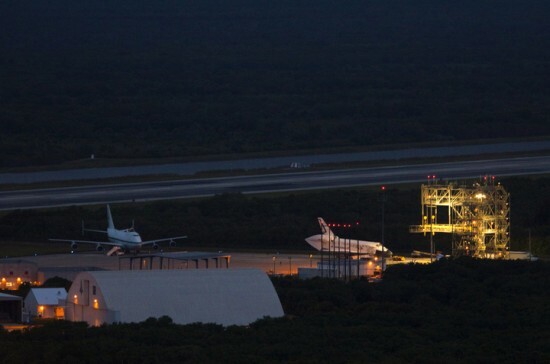 I was lucky enough to catch the take off of NASA 905 and Discovery on the NASA live feed earlier this week. It was genuinely breathtaking. If you’d like more images of the operation, you can get them from the NASA website.